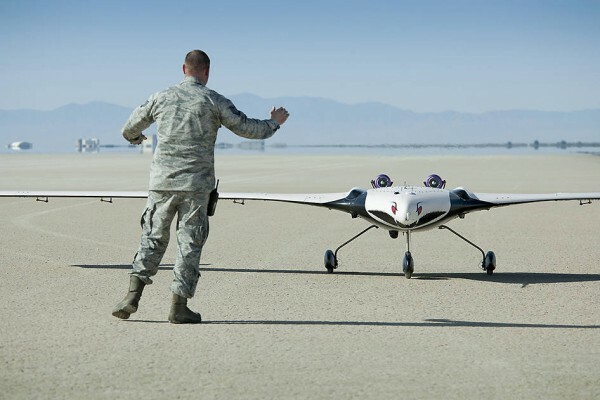 The X-56A Multi-Utility Technology Testbed (MUTT) is greeted on an Edwards Air Force Base runway by a U.S. Air Force Research Laboratory (AFRL) team member. NASA’s Armstrong Flight Research Center and the AFRL, along with participants from Langley Research Center and Glenn Research Center, and support from Lockheed Martin, are using the second X-56A (dubbed “Buckeye”) to check out aircraft systems, evaluate handling qualities, characterize and expand the airplane’s performance envelope, and verify pre-flight predictions regarding aircraft behavior. The 20-minute flight marked the beginning of a research effort designed to yield significant advances in aeroservoelastic technology using a low-cost, modular, remotely piloted aerial vehicle.